We take the Jesuit educational principle, Care for the Person (cura personalis), seriously at Marquette University Law School. In a special way, this value is expressed through our desire to listen to our students and to help them sort through the changes and challenges they might experience while attending law school. We are cognizant that a student brings so much more to law school than a sharp mind and a keen intellect. The design and features of Eckstein Hall itself contribute to wellness of the "whole person," all that encompasses mind, body, and spirit. The Office of Student Affairs is open until 7:30 p.m. Monday through Thursday when fall and spring classes are in session. There is almost always someone available for individual assistance on any matter. The Marquette University Counseling Center provides free, confidential counseling services to full-time students. For more information or to make an appointment, please visit the Counseling Center's website. The Eckstein Hall Fitness Center includes individual exercise equipment, shower rooms, and a workout room as well as fitness classes during the semester. Our students also enjoy use of the University's recreation centers for swimming, tennis, basketball, indoor running tracks, etc. The Eckstein Hall Fitness Center, however, is available for use only by members of the Law School community. 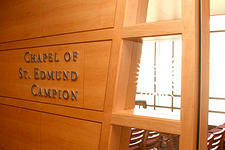 The St. Edmund Campion Chapel on the 4th floor is a quiet spot for private reflection and the location of monthly Masses during the school year, celebrated by Father Thomas Anderson, S.J., our law school chaplain. The Tory Hill Café serves wonderful meals (breakfast, lunch, and dinner during the fall and spring semesters) and offers a variety of healthy options for those hungry for something other than what the vending machines can provide. Current hours of operation can be found here.